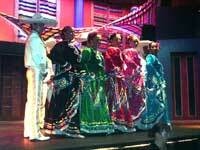 Held in Downtown Puerto Vallarta, at the town square, every Thursday night, this is the oldest and most traditional Mexican Fiesta in town. Sit under the stars and watch Mariachi and traditional Mexican Dancing, eat a tremendous Mexican Buffet Dinner, watch the kids hit Pinatas, witness the art of Cockfighting, and drink Tequila like a real Mexican. Kids will love the dancing horse and everyone will have a great time! Includes: Mexican Buffet Dinner, Open Bar, Traditional Mexican Dancing, Singing and Mariachi, Charros with Rope Twirling, Dancing Horse, Pinatas with souvenirs inside. Departs From: La Iguana in Downtown Puerto Vallarta. Directions will be provided with your confirmation.